Winches size 44 and above, made after 1999 can be converted to electric. The process is relatively straight forward but does need a bit of preparation. Also whilst we have been doing this for some time in the UK, please note that not all Harken dealers and distributors offer this service. If you are not UK based, please check with your national distributor. (See contact us section). Step 1) Read the other articles in this section! Step 2) Inspect your existing installation and double check your winch qualifies. The winch size is on the top decal, ie 44,46,48,53,56,64,66, 70 etc. 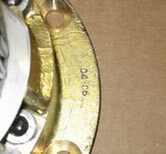 To check the date, take the drum off and look for the date stamp on the base, see example, 04-06 i.e made April 2006. If in any doubt, take some digital photos of it with and without the drum and e-mail them to us. Step 3) Determine if a horizontal motor or vertical motor would fit best. The horizontal motor installation is the most common and costs less. The vertical motor can be useful in some installation but is relatively rare. Again if in doubt, take some photos or ask your dealer/fitter to check. Armed with the above, you can ask your local dealer for a quote. In the UK Harken simply charge the retail price difference between a manual and an electric winch. You will also need to buy a control box, switches and a circuit breaker. As always, please do feel free to contact them. If you decide to proceed, the winch needs to come back to Lymington for modification. The actual changeover doesn’t take long provided the kits are in stock so the winch can come off one weekend and be returned for fitting the following. However, that can only happen if the work is planned in, so please give us a good lead time, ideally 4 weeks. The winch would be serviced, tested and returned ready to install as per a standard electric winch.